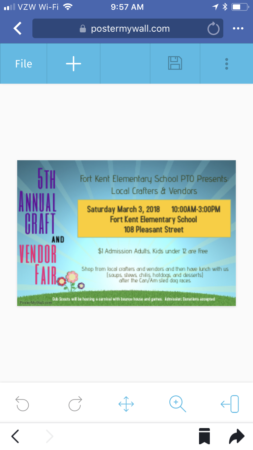 The Fort Kent Elementary School PTO is hosting the 5th Annual Craft & Vendor Fair. There will be handmade primitive decor items, jewelry, knitted/crocheted items, Scentsy, Mary Kay, Signature HomeStyles, and many others. There will also be a kids carnival with a bounce house, hosted by the Cub Scouts. 5th ANNUAL CRAFT AND VENDOR FAIR - Fort Kent Elementary School, 10 a.m.-3 p.m. Admission $1 for adults, free to children 12 and under. 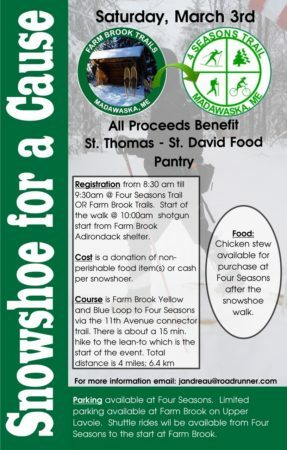 SNOWSHOE FOR A CAUSE - Madawaska, Farm Brook Trails and 4 Seasons Trail. All proceeds benefit St. Thomas-St. David Food Pantry. Registration: 8:30-9:30 a.m.; walk starts 10 a.m. from Farm Brook Adirondack Shelter. FMI: jandreau@roadrunner.com. PLAY "A FEW GOOD MEN" - Fort Kent, UMFK Fox Auditorium, 7 p.m. $10 at door or in advance, 834-7557. 26th ANNUAL CAN AM CROWN SLED DOG RACES - Fort Kent. ANTIQUE SNOWMOBILE SHOW/PARADE - Fort Kent, starts approximately 11 a.m. (after last musher has left), SW Collins parking lot. Sponsored by Carter Brook Snobirds. VETERANS FREE BREAKFAST - Fort Kent, American Legion Hall, 8-10:30 a.m. JUNIOR SKI PROGRAM - Fort Kent, Lonesome Pine Trails, 9-11 a.m.
4th ANNUAL SKIJORING RACES - Fort Kent Outdoor Center, starting at 3 p.m. Free to spectators; view from inside or outside the lodge.